Eriobotrya. (From Greek erion, wool, and botrys, a cluster of grapes, referring to the woolly, clustered panicles.) Rosaceae. Some ten species of evergreen shrubs or trees. Leaves alternate, simple, coriaceous, coarsely dentate; petiole short. Flowers small, white, in broad pyramidal, usually densely lanate-pubescent, terminal panicles; bracts deltoid-ovate, persistent; calyx 5-toothed, teeth acute, persistent; petals 5, ovate to suborbicular, clawed; stamens 20-40; styles 2-5, basally connate; ovary inferior, each locule 2-ovulate. Fruit an obovoid to globose pome, with persistent calyx teeth at apex, few-seeded; seeds very large. E Asia. 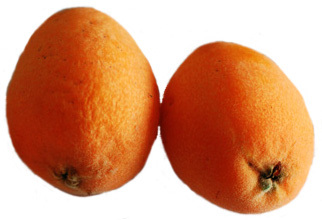 Eriobotrya japonica, loquat, which thrives best under plantation conditions, is extensively cultivated in subtropical and warm-temperate climates for its edible fruits, eaten raw, poached, stewed, as preserves, or pickled with sweet spices; in Japan there are over 800 varieties. 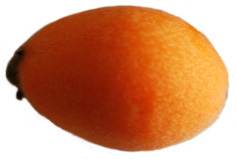 The fruit, which resembles an apricot, has a firm flesh and slightly acid, sweet aromatic flavour; the seeds are slightly poisonous. In temperate zones, Eriobotrya japonica makes a handsome architectural ornamental, with large, thick, glossy leaves of a heavily corrugated texture. The strongly fragrant, white flowers, which are bourne intermittently from early winter through until spring, are produced in quantity only after hot summers. The fruit ripens in spring, but is likely to be rendered inedible by hard frosts in cold areas. Eriobotrya japonica is frost tolerant to -5ºC and will survive temperatures to between -12ºC and -17ºC, albeit with damage to stems and branches. Eriobotrya species are tolerant of dry soils and of maritime exposure. Grow in fertile, well-drained soils, in full sun or light shade with shelter from cold winds, which will scorch the foliage. In regions at the limit of its hardiness, grow against a south-facing or southwest-facing wall. In cooler zones, grow in large pots or tubs in a well-drained high fertility loam-based medium; water moderately, allowing the surface of the medium to dry out between waterings. Give good ventilation, and maintian a minimum temperature of 5-10ºC. Topdress with fresh medium in spring. Prune in early spring, only to restrict growth and prevent congestion of the plant, particularly in the central area, thus maintaining good air circulation and preventing diseases induced by damp. Propagate by seed sown when ripe, by semi-ripe cuttings with a heel, or by air layering. Susceptible to fireblight, Erwinia amylovora. Under glass, Eriobotrya species are susceptible to glasshouse mealybug, Pseudococcus species; cut out and remove as many colonies as possible, discourage by frequent hosing. Persistent colonies can be painted with methylated spirits. Alternatively, use the predator Cryptolaemus montrouzieri as biological control. LOQUAT; JAPANESE LOQUAT; JAPANESE MEDLAR; NISPERO. Tree to 7m, coarsely-branching. Branches stout, densely covered with pale golden, coarse down when young. Leaves to 25 x 5cm, bold, somewhat deflexed, broadly oblanceolate to narrow-obovate, apex acuminate, base narrowed, sometimes toothed, deep green, lanate-pubescent above, later glossy, scurfy beneath; petiole to 1cm; stipules lanceolate-deltoid. Flowers in erect, crowded panicles. Fruit globose to pyriform, to 4cm diameter, yellow; seeds to 4cm. Autumn-winter. China, Japan. ‘Advance’: dwarf tree; fruit very juicy. ‘Champagne’: fruit very juicy, slightly astringent. ‘Gold Nugget’: leaves dark green; fruit profuse, large, pear-shaped, light apricot. ‘Variegata’: leaves variegated white. Z7.